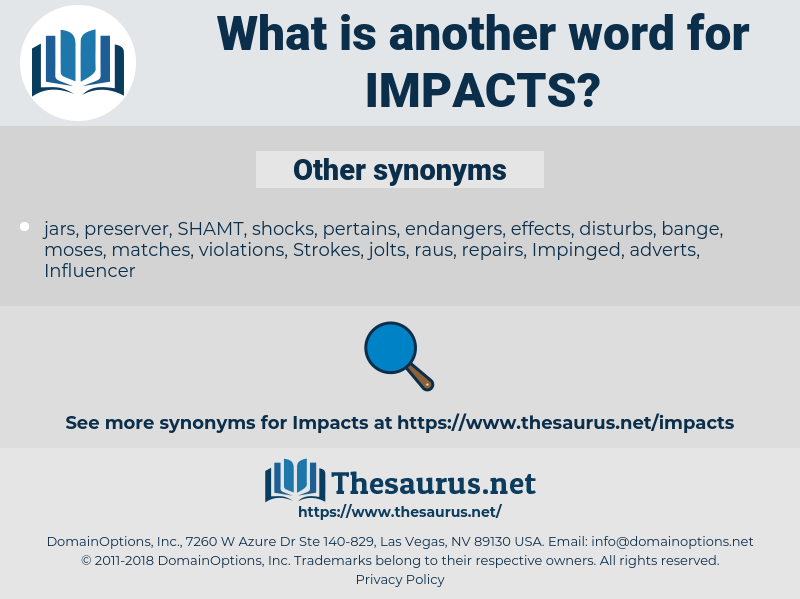 What is another word for IMPACTS? considerations, receipts, species, antiques, odds, relics, Les. accomplishments, accommodation, adaptation, adaptations, relics, adjustment, Adjustments, hits, adapt, Adapting, adapted, coping, data, CEPA, Them, recherche, station, U.S., notes, BTC, journal, OECD, shakes, finding, sur, spin-offs, FX, search, Les, goods, affected, affecting. importance, pacts, effectiveness, factors, aftereffects, impinges, conditions, contaminants, assessments, impressions, improvements, Artifacts, Concentrations, Activities, harms, side-effects, representatives, provisions, aspects, shortcomings, externalities, complications, fluctuations, considerations, disruptions, Evaluations, sustainable, Artefacts, Possibilities, bearings, expectations, terms, perturbations, economic, environment, Environments, stockpiles, conflicts, Populations, actions, archaeologists, alternatives, matters, medications, damages, development, developments, costs, estimates, archeologists, stakes, Measures, by-products, steps, receipts, times, temperatures, practices, disturbances, pollution, stakeholders, components, profits, initiatives, Ecosystems, articles, enterprises, constraints, conclusions, principles, appraisals, Measurements, materials, analysis, Analyses, pollutants, characteristics, economics, pay-offs, applications, scope, quality, downstream, Communities, parameters, setbacks, statements, Risks, reflections, Opportunities, projects, possessions, pressures, degradation, threats, infringements, patterns, incidents, Firms, species, collisions, Phenomena, causes, associates, payoffs, experiences, options, waters, obligations, ways, functions, rates, Criteria, interventions, ripples, things, prints, assaults, respects, vestiges, objectives, shocks, points, violations, occurrences, remains, beatings, meanings, situations, changes, objects, centers, headings, barriers, touches, inputs, requirements, missiles, thousands, audit, merits, endpoints, challenges, Economies, clean-up, features, crashes, papers, reductions, Provided, marks, stocks, partners, titles, Tracks, attacks, Securities, L, symptoms, BOMBS, losses, Legacies, programmes, sediments, antiques, dangers, fumes, Casualties, Movements, departments, extremes, long-term, inferences, hazards, parks, responses, item, items, peoples, dividends, processes, Inventories, Ones, burdens, shifts, Penalties, Scars, events, targets, places, Injuries, devices, advantages, accesses, furnishings, variables, stresses, Programs, Gains, Hearings, proposals, treasures, strategies, Fruits, drivers, signs, Frequencies, ends, Studies, intents, coups, views, defects, trends, centres, efectos, speeches, bullets, choices, systems, groups, scores, bills, meters, expenses, Industries, questions, IAS, METALS, lessons, types, demands, odds, requested, fr, jumps, cases, fins, Focuses, Rewards, levels, users, concerns, Policies, eyes, reasons, Properties, shells, abuses, breaches, issues, accomplishments, Efforts, wounded, returns, zones, Goals, shares, pros, Areas, organs, horrors, >, cuts, bonds, birds, Shots, Strokes, rounds, lands, adaptations, relics, adjustment, Adjustments, hits, coping, LINEs, data, notes, spin-offs, goods. impairs, afflicts, impedes, jeopardizes, undermines, alters, permeates, determines, threatens, endangers, contributes, pertains, implies, exists, reflects, leverages, hurts, encompasses, hampers, interfaces, impinges, aims, concentrates, intervenes, diminishes, entails, receives, allocates, prefers, hinders, shapes, Comes, compromises, harms, assigns, informs, touch, interferes, weighs, favours, plagues, relates, applies, Carries, Plays, works, extends, involves, damages, erodes, reaches, Addresses, covers, happens, follows, controls, appears, Bears, accounts, leads, knock, night, passes, turns, enters, takes, regards, lies, causes, means, seems, goes, draws, deals, changes, touches, refers, Has, raises, challenges, knows, marks, falls, seeks, shifts, targets, fins, Focuses, makes, Does, gets, returns, cuts, hits, Les. repercussions, spillovers, effects, effect, implication, implications, incidence, affect, Affects, consequence, consequences. 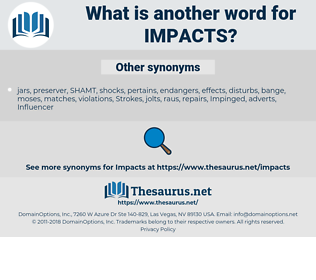 significance, ramifications, reverberations, fallouts, Incidences, interactions, spinoffs, Crises, Roles, Strikes, clashes, problems, repercussions, spillovers, effects, implications, incidence, affect, Affects, consequence, consequences. effects, repercussion, effect, implication, fall-out, spillover, affect. associate, Strikes, concerns, spillovers, effects, effect, implications, incidence, Affects, consequences.